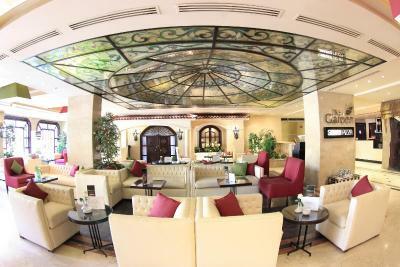 I like the reception staff, Azza, Seham and all, I like also the furnishers, location and food. We got upgraded to a suite free of charge! breakfast was great had a lot of variety and friendly staff! amazing experience! Thank you Pyramisa! Some of the staff we amazing. The bellman where courteous and so helpful. Breakfast delicious! Hot dishes that vary from day to day! Bank/Exchange inside the hotel ! 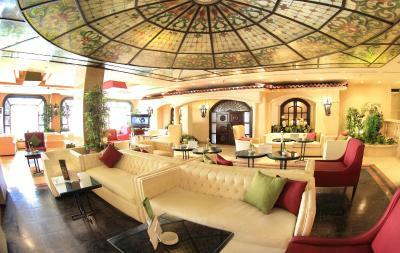 spacious lobby and many restaurants inside ! 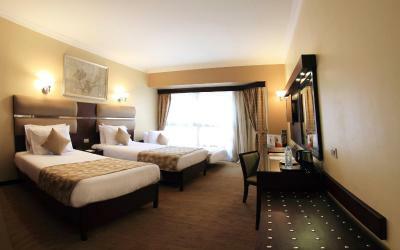 The rooms were spacious and the beds were very relaxing. It was all clean. The staff was very nice, helpful and understanding. The breakfast was very rich and various. I loved it all. I would definitely comeback here if I ever visit Cairo again. The best value of this hotel is the Staff who every one of them try to help with big smile in particular Aubadah at the concierge and Azza,Islam at reception and above all Seham the front desk manager. 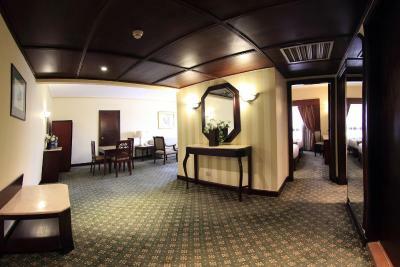 Pyramisa Suites Hotel Cairo This rating is a reflection of how the property compares to the industry standard when it comes to price, facilities and services available. It's based on a self-evaluation by the property. Use this rating to help choose your stay! 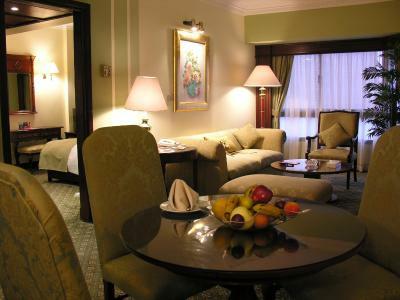 One of our top picks in Cairo.Located in the Dokki district of central Cairo, Pyramisa Suites Hotel offers rooms with Nile River or city views. 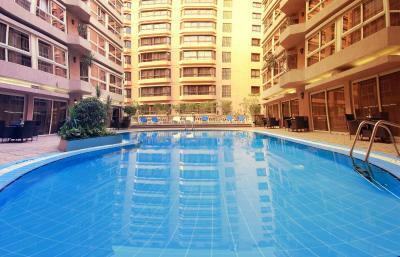 It has a full service spa and 2 outdoor pools. Each spacious room at the Pyramisa Suites is fitted with air conditioning, TV, free WI-FI, coffee & tea facilities and a mini-bar. 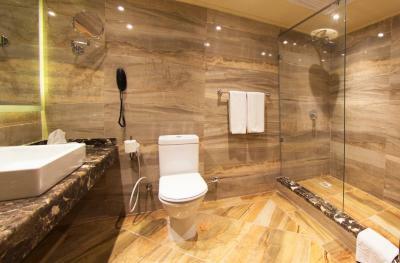 The private bathroom comes with amenities and a hairdryer. 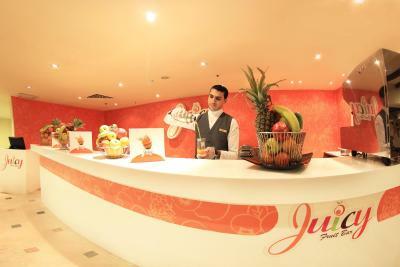 The hotel’s wellness center offers a range of treatments including massage and hydrotherapy baths. 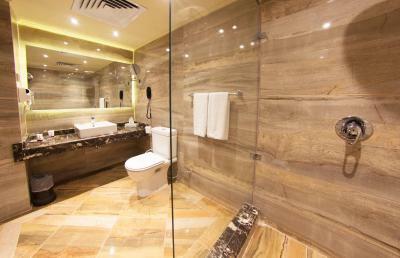 There is also a hammam, sauna and a fitness center. It also offers a beauty center and a hot tub. The Pyramisa Suites Hotel offers a choice of 4 restaurants, serving food ranging from classic Egyptian and Italian cuisine to Indian and Chinese specialty dishes. 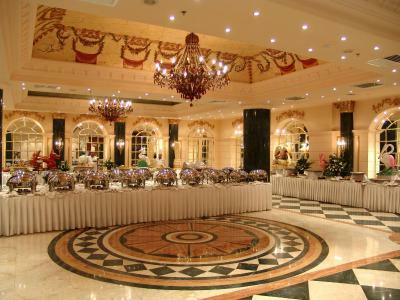 Also featured is an international buffet restaurant. Dokki Metro Station, just 1,650 feet from the Pyramisa, connects with 2 stops to Tahrir Square. The Egyptian Museum is a 5-minute drive from the hotel and the Giza Pyramids are 30 minutes by car away. When would you like to stay at Pyramisa Suites Hotel Cairo? Features tea/coffee making facilities and free Wi-Fi. 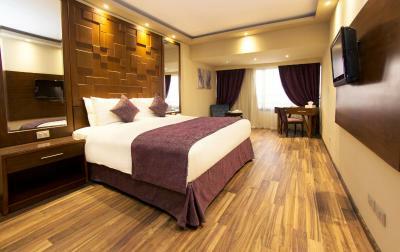 This suite has a separate living room, tea/coffee making facilities and free Wi-Fi. Spacious 3-bedroom suite with a separate living room and city views. 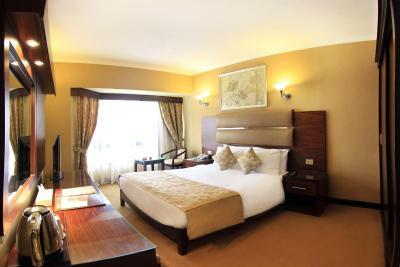 This suite has a separate living room, tea/coffee making facilities and free WiFi. 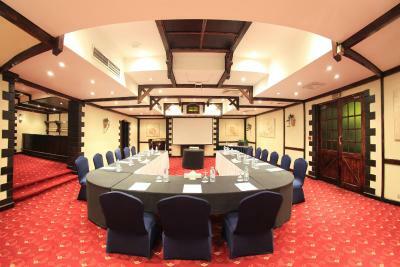 Features a separate living room, tea/coffee making facilities and free Wi-Fi. 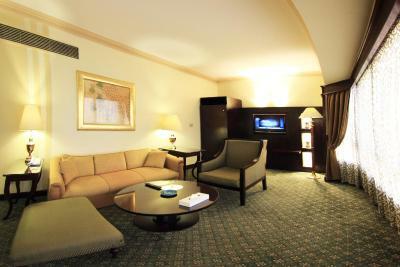 This twin/double room features a private entrance, fireplace and tile/marble floor. Egyptians are known for their warm welcome and exceptional attitude. 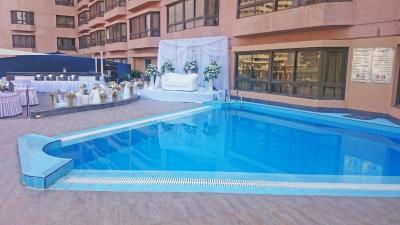 At Pyramisa Hotels, we guarantee Authentic Egyptian Hospitality done right. 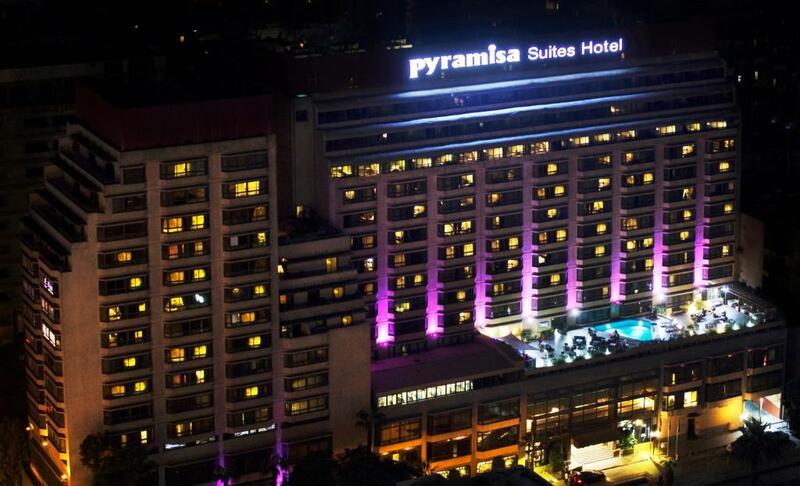 Pyramisa Hotels is the leading Egyptian 5 Star Hotel Chain for a reason – we aren’t trying to imitate other hotel chains. We have a unique identity that reflects Egypt’s atmosphere. We understand that our valued guests visit Egypt to understand more about the country, its culture, and its people – to experience Egypt, not just visit it. 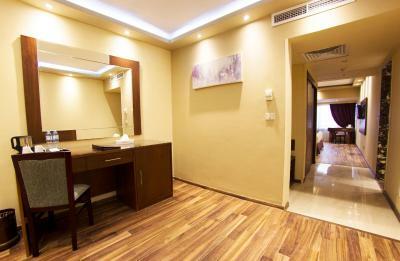 Therefore, everything about our properties is a reflection of Egypt. 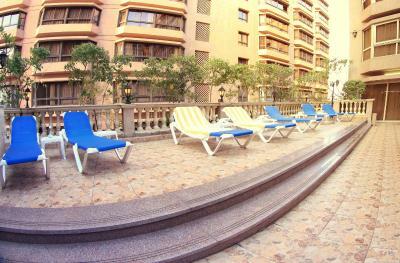 If you’re looking for a truly Egyptian experience, please allow us to pamper you at Pyramisa! 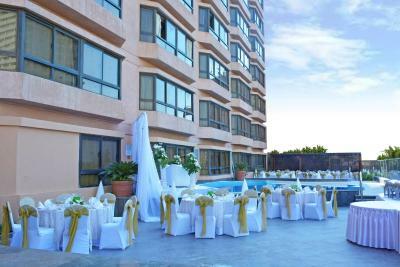 House Rules Pyramisa Suites Hotel Cairo takes special requests – add in the next step! 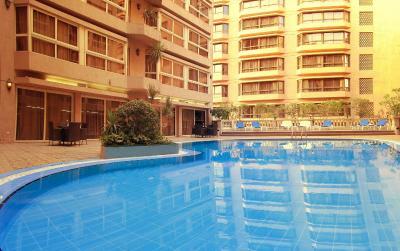 Pyramisa Suites Hotel Cairo accepts these cards and reserves the right to temporarily hold an amount prior to arrival. Please note that for half-board rates, dinner will be a set menu at an à-la-carte restaurant. We arrived at the hotel at 01:00am in a morning as I told the hotel for expectation arrival time. It took so long at check-in. I had to wait 30 mins before we finally got the room. We were given a family room which was very old and floor was not clean. It was totally different from the picture at booking.com web page. I definitely won’t recommend this hotel to anybody. Old furniture, understaffed reception, poor breakfast and bad facilities. The hotel showed a price in your web site when i booked it and i wanted to pay at the property the price went up up the i paid 380$ instead of the original price which is 289$ ! !